Brönnti Creme, otherwise known as Gebrannte Creme, Caramelcreme, or Brönnti Greeme, is an absolutely classic Swiss dessert. You’ll find it on the menu everywhere, from Grosi’s kitchen to Landgasthofs and high-end restaurants. It’s not so different from other classic caramel desserts—crème catalan, caramel, or brûlée—though it’s not as firm, and instead of a caramel crust or sauce, there is the simple addition of more cream. The first hurdle is the caramel. Get nervous and pull your caramel off a second too early and you won’t get that rich caramel flavour. Be bold and leave it a shade too long, and there is no escaping a slightly burnt taste. Many recipes use an egg based custard which, if your milk is too hot, can curdle and become caramel-flavoured scrambled eggs that no amount of straining will save. In my attempt to make the perfect Brönnti Creme I have tried (and failed) numerous times. A perfect version for me is as caramelly as possible, so I let my sugar caramelize for as long as possible. I am happy to leave out the eggs in favour of a little cornstarch or custard powder, even if this means a slightly less firm creme. I was pleased to learn that some of the best cooks (and Grosis) prefer this egg-free method—including Fritz Gfeller, who mentions Gotte Mina’s Brönnti Greeme in his Emmentaler Küche, and the indomitable, Michelin-starred Rosa Tschudi, whose recipe I found in an unusual place—Swiss mascot Globi’s kid’s cookbook (though it’s also in her own cookbook too). I didn’t have vanilla custard powder, which Gfeller prefers, so I went with Tschudi’s cornstarch. This recipe is easily doubled to feed a crowd. Put the cream in a small bowl and sift in the cornstarch. Whisk well and set aside. Place the sugar in a large pot and shake a little so that you have an even layer of sugar across the bottom. It’s best to use a pot with a silver bottom, black bottoms make it hard to see the sugar changing colour. Have your water and milk measured out and at the ready. Over medium high heat, melt the sugar. It will start to turn clear and liquid, then golden. If things are going too quickly, or you have a hot patch where sugar is smoking, don’t be afraid to pull you pot off the heat. When the sugar has liquefied, start to gently stir and wait for the caramel to turn amber. 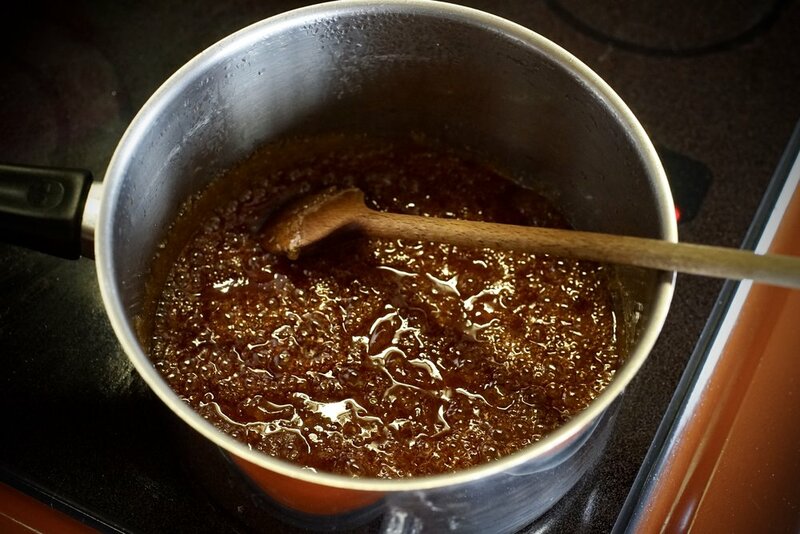 Once you have your desired caramel colour, add the water—WATCH OUT, it will sputter—and briefly take the pot off the heat. The caramel will seize up a little, just keep stirring gently, place the pot back over the heat, and everything will melt back together. Once it’s mostly melted, add the milk, salt, and vanilla. Heat until all the caramel is melted and the mixture is bubbling. Whisk in the cornstarch mixture. Let this cook and bubble for a couple of minutes, until it starts to thicken. Strain into a bowl, and let cool slightly. It will be pretty runny at this point, but will thicken up while cooling and once the whipped cream is added. Press a piece of plastic wrap directly on the surface and place in the fridge. Let cool for at least 2-3 hours. When you are ready to serve, whip the cream. Whisk three-quarters into the cooled caramel. Use the rest as garnish, piping or spooning a dollop onto each serving. Use a sift when adding the cornstarch to the cream to prevent clumping. Caramelizing sugar can be dangerous work—it is incredibly hot, and it can turn from golden to black in a matter of seconds. Keep an eye on it at all times. 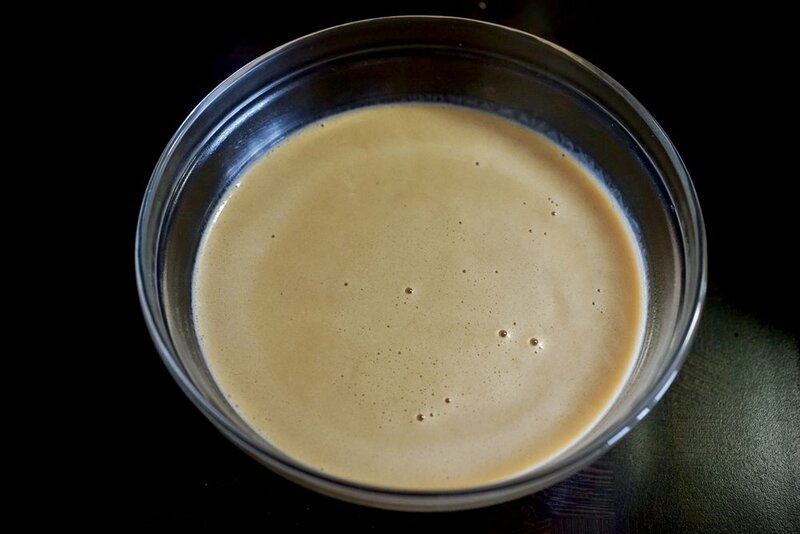 It can be a challenge to get the perfect colour of caramel. As soon as it turns amber add the water, which stops it from caramelizing further.